We are delighted to announce that LEIA (the trade association and advisory body for the lift and escalator industry) has invited bandv to develop and run the latest instalment in their ‘Liam Loves’ safety campaign series; introducing ‘Liam Loves Escalators’. Following on from the success of last year’s LEIA safety campaign, ‘Liam Loves Lifts’, LEIA has asked bandv to once again produce the story and illustrations for a free story book (and this time a poster too), aimed at educating children (and parents) about how to use escalators safely. The awareness campaign is set to launch this Autumn and we couldn’t be happier to once again be involved in a safety campaign on behalf of LEIA, to highlight and raise awareness around the issues of child safety when it comes to escalators. One of LEIA’s key objectives is to provide advice on health, safety and standards and this latest initiative highlights LEIA’s commitment to this cause. Both entertaining and educational, the new ‘Liam Loves Escalators’ children’s storybook has been written by bandv’s PR Director Angela Breckenridge and the fabulously fun illustrations have been put together by our Graphic Designer Sally Berkeley. 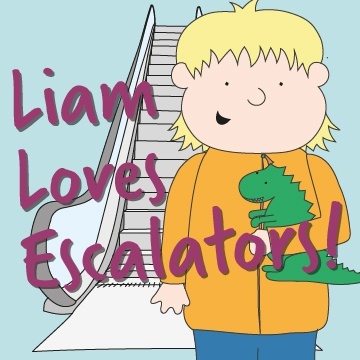 We will also once again be managing all promotion and advertising of the new ‘Liam Loves Escalators’ storybook. Liam Loves Escalators is available now so visit the LiamLoves Facebook page to order your FREE copy of the book and poster!